After making an 18th century muff for myself, my mom suggested I try making a doll-sized one. So that's what I did today - I already had some smaller silk printed portraits from spoonflower (I got them when I got the bigger ones, to play with using them for pins.) and I still had just enough tiny sequins left. The green ribbon is vintage (which actually ended up being a problem because it broke when tried to use it as a drawstring. So I had to redo it more carefully. 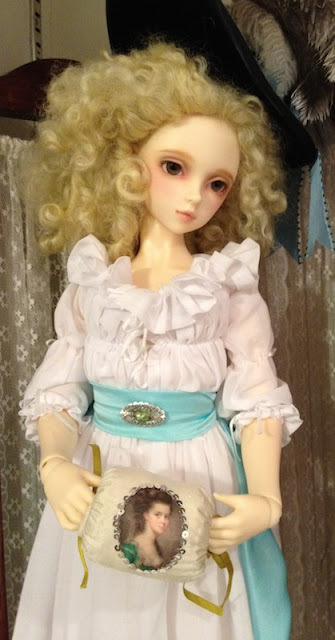 I've been making and selling 18th century clothes for BJD's. No muffs so far, but it's a possibility. 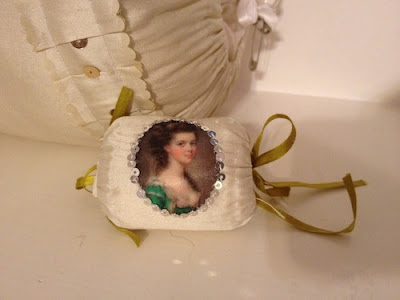 Lovely work on the muff, and her chemise a la reine is sweet too! You should make them - they are pretty easy to do! And thank you, a friend made the chemise gown for me. :-) Do you have pics of what you've made for your ball-jointed dolls? I'd love to see them!